Is That John or Mary Magdalene Seated Next to Christ? "The Last Supper" is one of the great Renaissance painter Leonardo Da Vinci's most famous and fascinating masterpieces and the subject of many legends and controversies. One of those controversies involves the figure seated at the table to the right of Christ: Is that St. John or Mary Magdalene? The History of "The Last Supper"
Although there are multiple reproductions in museums and on mouse pads, the original of "The Last Supper" is a fresco. Painted between 1495 and 1498, the work is enormous, measuring 15 x 29 feet (4.6 x 8.8 meters). Its colored plaster covers the entire wall of the refectory (dining hall) in the Convent of Santa Maria delle Grazie in Milan, Italy. The painting was a commission from Ludovico Sforza, the Duke of Milan and Da Vinci's employer for nearly 18 years (1482–1499). 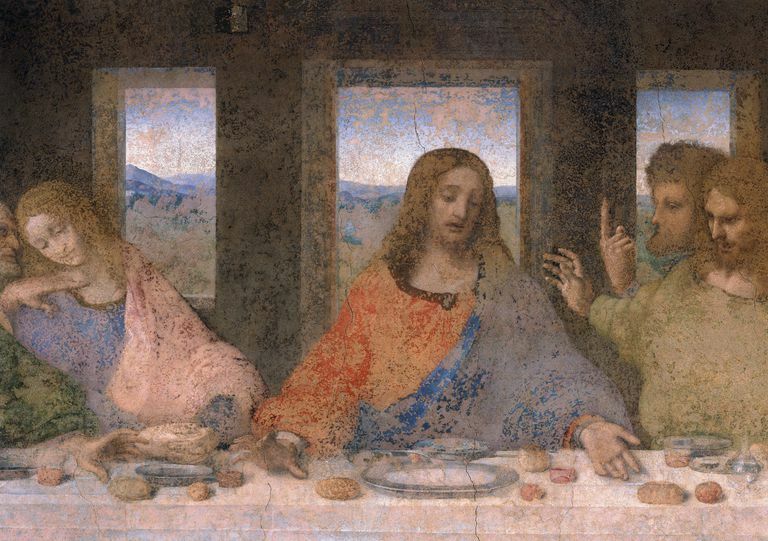 Leonardo, always the inventor, tried using new materials for "The Last Supper." Instead of using tempera on wet plaster (the preferred method of fresco painting, and one which had worked successfully for centuries), Leonardo painted on dry plaster, which resulted in a more varied palette. Unfortunately, dry plaster is not as stable as wet, and the painted plaster began to flake off the wall almost immediately. Various authorities have struggled to restore it ever since. "The Last Supper" is Leonardo's visual interpretation of an event chronicled in all four of the Gospels (books in the Christian New Testament). The gospels say that the evening before Christ was to be betrayed by one of his disciples, he gathered them all together to eat, and to tell them that he knew what was coming—that he would be arrested and executed. There he washed their feet, a gesture symbolizing that all were equal under the eyes of the Lord. As they ate and drank together, Christ gave the disciples explicit instructions on how to remember him in the future, by using the metaphor of food and drink. Christians consider it as the first celebration of the Eucharist, a ritual still performed today. The biblical scene had certainly been painted before, but in Leonardo's "The Last Supper" the disciples are all displaying very human, identifiable emotions. His version depicts iconic religious figures as people rather than saints, reacting to the situation in a human way. Furthermore, the technical perspective in "The Last Supper" was created such that every single element of the painting directs the viewer's attention straight to the midpoint of the composition, Christ's head. It is arguably the greatest example of one-point perspective ever created. Emotions in "The Last Supper"
"The Last Supper" depicts a moment in time: It illustrates the first few seconds after Christ told his apostles that one of them would betray him before sunrise. The 12 men are depicted in small groups of three, reacting to the news with differing degrees of horror, anger, and shock. Bartholomew, James Minor, and Andrew form the first group of three. All are aghast, Andrew to the point of holding his hands up in a "stop!" gesture. The next group is Judas, Peter, and John. Judas's face is in shadow and he is clutching a small bag, perhaps containing the 30 pieces of silver he received for betraying Christ. Peter is visibly angry, and a feminine-looking John seems about to swoon. Christ is in the center, the calm in the midst of the storm. Thomas, James Major, and Philip are next: Thomas clearly agitated, James Major stunned, and Philip seems to be seeking clarification. Finally, Matthew, Thaddeus, and Simon comprise the last group of three figures, Matthew and Thaddeus turned away to Simon for explanations, but their arms outstretched towards Christ. Is that John or Mary Magdalene Next to Jesus? In "The Last Supper," the figure at Christ's right arm does not possess an easily identified gender. He's not bald, or bearded, or anything we visually associate with "masculinity." In fact, he looks feminine: As a result, some people, like the novelist Dan Brown in The Da Vinci Code, have speculated that Da Vinci wasn't depicting John at all, but rather Mary Magdalene. There are three very good reasons why Leonardo was likely not depicting Mary Magdalene. 1. Mary Magdalene wasn't at the Supper. Although she was present at the event, Mary Magdalene wasn't listed among the people at the table in any of the four Gospels. According to Biblical accounts, her role was a minor supporting one. She wiped feet. John is described as eating at the table with the others. 2. It would have been blatant heresy for Da Vinci to paint her there. Late 15th-century Catholic Rome was not a period of enlightenment with regard to competing religious beliefs. The Inquisition began in the late 12th century France. The Spanish Inquisition began in 1478, and 50 years after "The Last Supper" was painted, Pope Paul II established the Congregation of the Holy Office of the Inquisition in Rome itself. The most famous victim of this office was in 1633, Leonardo's fellow scientist Galileo Galilei. Leonardo was an inventor and experimenter in all things, but it would have been worse than foolhardy for him to risk offending both his employer and his Pope. 3. Leonardo was known for painting effeminate men. There is controversy over whether Leonardo was gay or not. Whether he was or wasn't, he certainly devoted more attention to male anatomy and beautiful males in general, than he did to female anatomy or females. 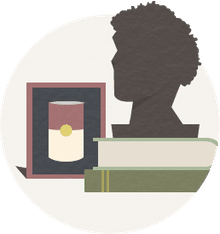 There are some rather sensuous young men depicted in his notebooks, complete with long, curly tresses and modestly downcast, heavy-lidded eyes. The faces of some of these men are similar to that of John. Based on this, it seems clear that Da Vinci painted the apostle John swooning next to Christ, and not Mary Magdalene. The Da Vinci Code is interesting and thought-provoking, but it is a work of fiction and a creative tale woven by Dan Brown based on a bit of history, but going well above and beyond the historical facts.